Your invoice may be the only tangible document that your customer receives from your business. In many ways, it can become the face of your business, especially if you have a sole-proprietor service business. If you are starting a contracting business or other small business, it may be that you’ve never created an invoice before. Invoices should include certain information to be useful to both you and the customer. 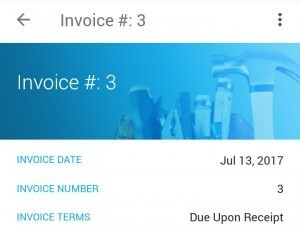 This blog post will walk you through how to create an invoice. When a business completes a transaction of goods or services, that business issues an invoice to the purchaser. The invoice firmly lists the details of the transaction and sets a due date for payment. Invoices are a record of business transactions that are important for bookkeeping and accounting purposes. Invoices follow a predictable format. Templates and examples are widely available online. One thing you’ll notice is consistency from one example to the next, as nearly all invoices include certain pieces of information that may need to be referenced later. First and foremost, the invoice should include the business name and logo. The top of your invoice is valuable space and it should prominently feature your name and branding to make an impression on your customers. Don’t miss the opportunity. A business name is vital but adding contact information is just as important. The purchaser needs to know where to send their money and how to contact you if they have questions. Include as much information as possible for contacting you. Your address, your phone number and a website (if applicable) should be clearly listed at the top of the page as well. Clearly state who you are sending this bill to. This should include the name of the business or individual and their address. This is important for your records, but it also assures the purchaser that this is their bill and hasn’t been mixed up with the bill for another client. 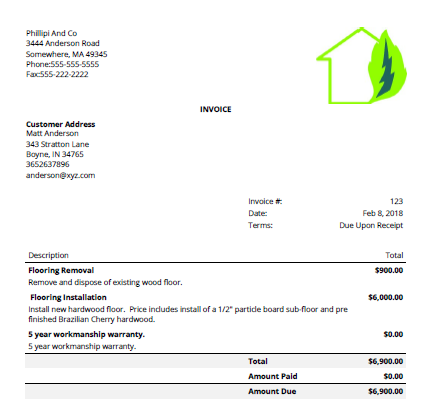 An invoice should make it clear that it is, in fact, an invoice by labeling it with the word invoice, bill of sale or statement. The document should make it clear whether or not payment is still expected. If you are running a small business, it may not seem necessary to include an invoice number. An invoice number is one more way to help keep your bookkeeping organized. Having a unique invoice number makes the document easy to locate, whether in hard copy or in the computer. The unique number can be structured in a way that gives you good information before you have to look it up. It can include a client number or project number so that all invoices to a certain client are easy to find. An invoice date is the date the invoice was created. Placing the date on the document establishes the timeframe for payment, as you should also include the date that payment is due. As we’ve mentioned in the past, for contractors we strongly recommend that your payment terms dictate that payment is due on receipt. However, there are a number of different options as far as payment terms, and your business may choose to do something other than having payment due on receipt. Either way, the terms and date due should be made clear on the invoice. Many invoices also include a statement of the fee the client should expect if it will take them longer than the due date to pay the bill. Again, putting that statement right on the bill will help avoid miscommunication down the road, and motivates customers to pay you on time. Just like a receipt from the grocery store, your invoice should itemize each part of the transaction and the accompanying charge. Customers want to know exactly how you arrived at the bottom line. The more detailed you can be, the better. If you must charge sales tax, include that on the invoice. You’ll be glad you did when it comes to tax time. Just because your transaction is completed, doesn’t mean you should stop selling to this customer. Make sure they know what a great deal they got from you. If you gave them a discount, list it clearly on the invoice. The bottom of the invoice can include a thank-you statement or your tagline. Including touches like this communicates to your customers that you are a serious business and you conduct yourself very professionally. Adding branding to your invoice helps cement your business in their minds, which will lead to them seeking you out next time they need the same service and will keep you top of mind if a friend needs the same service. Talking about money can be awkward, so creating an accurate invoice the first time communicates to the customer that your services are valuable and that you understand the value of their money. If you are a small business providing a service like lawn care or handyman services, not producing a clear and concise invoice can invite unwanted negotiation from the customer. Providing an invoice that clearly details your fees can nip this in the bud. Invoices provide you, the business owner, with a record of how you’ve spent your time and resources. It can help you set pricing for new services and keep track of how long certain jobs take. Keeping a digital record of your invoices makes it easier to track information like this. Digital records preserve your work history. With a few keystrokes, you can see how much you’ve earned this month and what invoices are still outstanding. Click here to download a sample invoice. On top of this, you can upload price lists so you can quickly add items with pricing and descriptions to your invoices instantly. We’ve even put together sample price lists you can download to help get you started. With JobFLEX, you can generate an invoice right from the jobsite. If you’ve created an estimate in JobFLEX, with a couple of taps on your Android device you can turn that into an invoice and email it to the customer before you even head to your next job. When you get busy, it can be hard to keep up with your invoices, but JobFLEX makes that easier, too. JobFLEX offers simple reporting so you can quickly and easily find any invoices that are past due so you can follow up with the customer. Quite simply, JobFLEX is the perfect tool to help you easily generate invoices that will impress your customers and help you get paid more quickly.